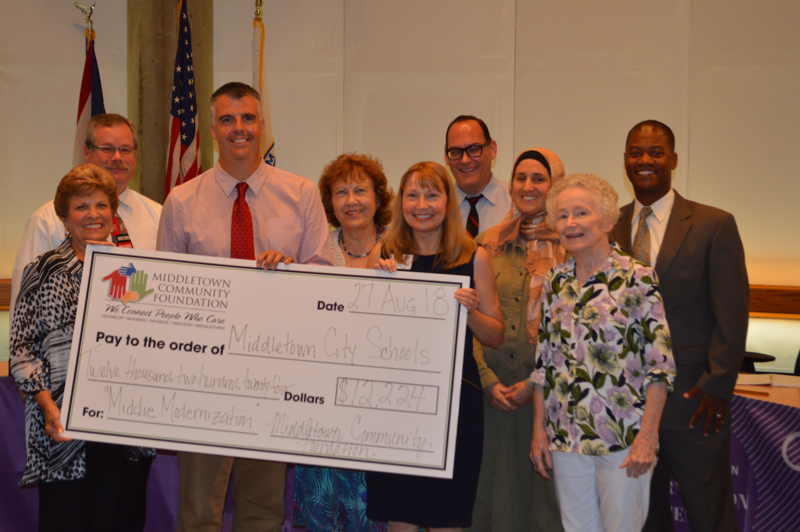 The hard work of the Middletown City School District (MCSD) administration paid off to the sum of a $12,224 grant from the Middletown Community Foundation. At the Aug. 27 Middletown Board of Education meeting, Chris Urso, MCSD Board President, accepted a $12,224 check from the Middletown Community Foundation. The grant funds will go towards Augmented Reality and Virtual Reality (AR/VR) devices for the new AR/VR course being offered at the Middletown High School, the Makerspace at the Middletown Middle School, and to provide all students with the opportunity to engage and learn from a virtual reality experience. “We’re thrilled the Middletown Community Foundation grant gives Middletown Schools the ability to dive in further with our district STEAM initiative, especially the ‘A’ in STEAM. We’re trailblazing a new path for our Arts Programs and the AR/VR devices gives us a way to leverage technology through those creative departments,” said Prohaska. The partnership between the two entities is well-established, but the leaders of the organizations have a vision to close the gaps between district and community. The MCSD Board of Education along with the district’s administration are confident community partnerships are a key part to the district’s implementation of forward-thinking, innovative learning models. “On behalf of the Middletown Board of Education, I would like to thank the Middletown Community Foundation for providing the grant funds for our students. These dollars will allow our school leaders to expand the STEAM programs within our school district and this innovation will not only benefit all of our students, but also keep our curriculum relevant and future-thinking,” said Chris Urso, President of the Middletown Board of Education.